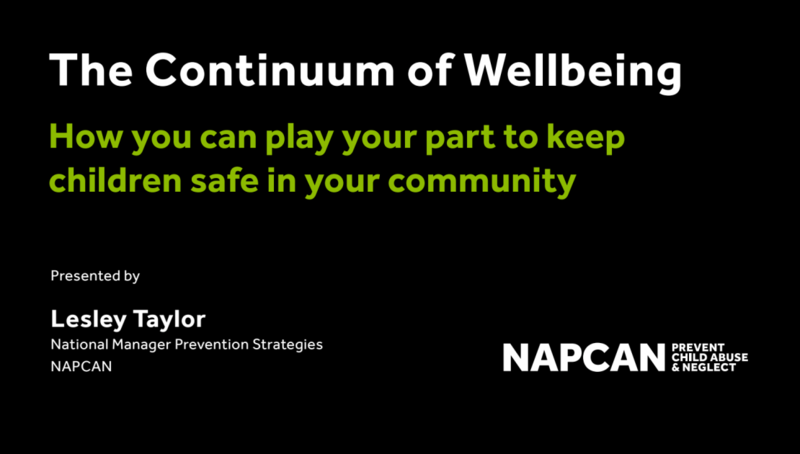 This National Child Protection Week, NAPCAN is proud to be launching a short 3-minute film outlining the concept of the continuum of wellbeing. This concept is important to our work because it underpins the importance of prevention and reminds us that child abuse and neglect is not inevitable, and that there are many opportunities for everyone in the community to help protect children. We all have a role to play in the protection of children, and this can best be described with, what we call, the Continuum of Wellbeing. On one end of the continuum we have CHILD SAFE FAMILIES happy/healthy families where children are loved, nurtured and protected. On the other end of the continuum we the tragic stories of child abuse and neglect. We often read about these as newspaper headlines and wonder ‘how did it get to that point; where were all the people could have helped before it was too late?’. Child abuse can be a one off incident but it tends to be a series of events that get more and more serious over time – an ever increasing, more serious sequence of events that may get steadily worse over time to reach the threshold of abuse or neglect. That threshold is defined by laws in every State and Territory and defines the point at which child protection services have the right to intervene and make decisions about a child’s safety with or without the parents’ permission. Child protection services cannot take action unless the circumstances are so serious that a child is no longer safe with their family. This means that everything that happens before that threshold becomes an opportunity for you and I to take action.